I am always surprised at how my quilt photos don't look nearly as lovely as the real thing. This post today is especially for my non-quilting friend Fern, in Illinois, so she can get an idea of what its all about. The quilts are not judged - it is Viewer's Choice. When viewers enter the show, they are given a ballot, if they choose. There are about 7 categories, and it's a big job to go through the process of voting! We are always grateful for their efforts! Viewers are not always quilt-knowledgeable so results are occasionally surprising and unpredictable! 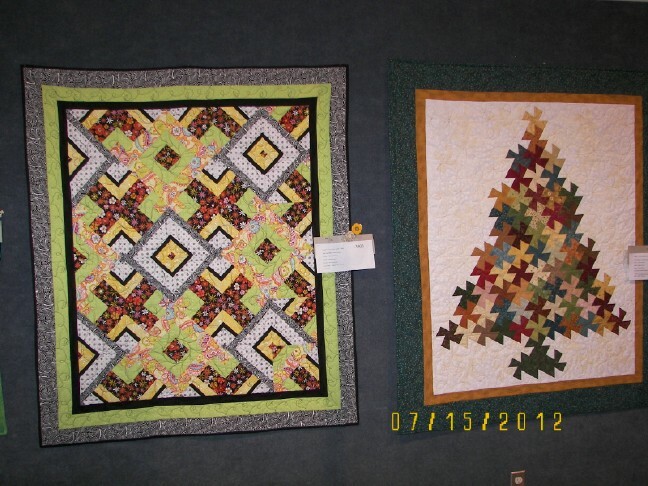 Not all the quilts are from guild members -- non-members may also submit their quilts. 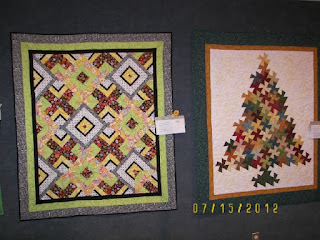 Above is the Serendipity (Raffle) quilt that was won by Joy, a new resident of my own town. Joy happens to be a sometimes quilter and we've roped her into joining our local quilting group! Look at how the colors are mathematically arranged and mirrored. The organizer of it's design is a math teacher. Here are many of the miniature quilts, That center "fan" was the winner, Congratulations Irene! Irene won MANY ribbons this day - she deserves it and is a wonderful member of our Guild. The wall of this gym is lined with carpet and makes for an excellent hanging space. This is my own "Step Lively", with the inventive border and here it can hang nice and straight. 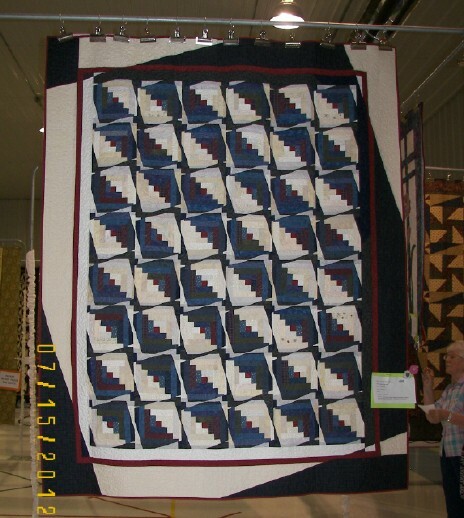 These are "small" quilts. I've always liked that design/technique on the left, Hidden Wells, but the tree on the right was the winner. Here was a group of "Challenge Quilts" with the theme "2 over 1 over 3". (Two blocks over one block over 3 blocks") -- all had to be a specific dimension. 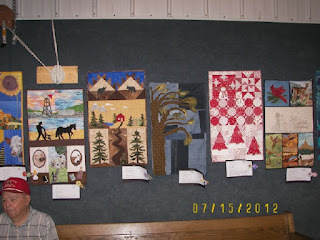 Creativity was fantastic, but I missed the winner, that item over the man's head - It was all free-form machine embroidery! Very Nebraska with the sunflowers, windmill, steer and ???. The winner was very talented Kim, so creative, and an art teacher AND the Guild newsletter editor! She always comes up with amazing ideas! Here is what our Silent Auction is like. People bid on an item - sometimes no one else bids and it goes for very little money, and other times several people will keep bidding each other up. At the end of the 3-day show, the hightest bidder is called and comes for the item. The temp outside was around 100 degrees and this area is NOT air conditioned. Someone loaned us two Swamp Coolers - We think they helped a little, along with many fans. Thanks for taking us to the show. It is fun to see the trends in different parts of the country. 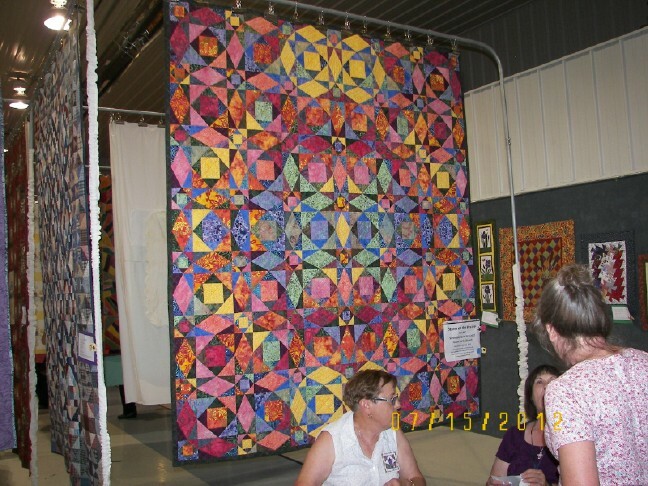 The raffle quilt is gorgeous! Joy is very lucky. My goodness, some of those mini quilts are tiny. I love seeing it all, Elaine. That is an amazing raffle quilt! 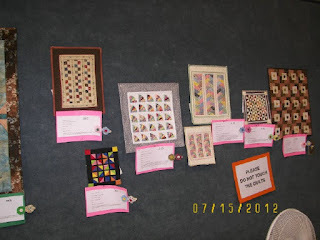 Fabulous pictures and fabulous quilts! 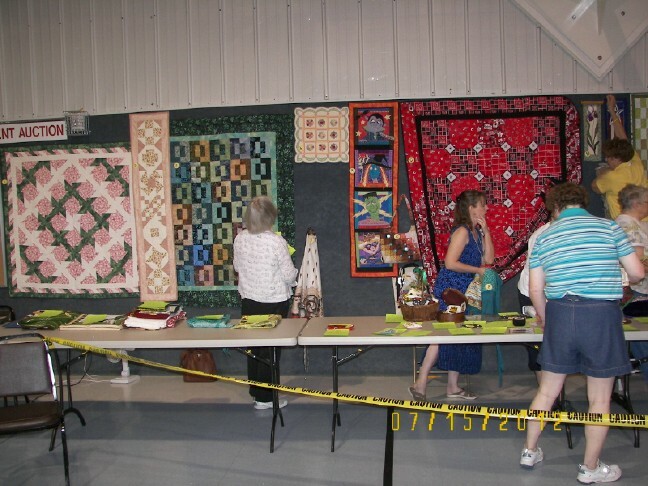 That raffle quilt is to die for! I never heard of a swamp cooler but I sure hope that it helped with the excessive heat that you have been surviving. The ISP changes seem to be going well as far as I can tell. Now I hope you can REST a bit. You make me want to quilt again!